Deliver a ring to Calcelmo. Deliver Calcelmo's Ring to Calcelmo in Understone Keep. 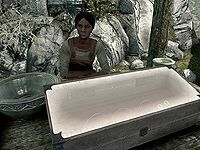 Kerah is the owner of the jewelry stall in the Markarth's marketplace. Talk to her and she will share some information about the city and her family with you: "My family came here centuries ago. We've made a good living smithing the silver that flows through the city." If you want to know more about the fancy carvings and stonework, she will recommend that you visit Calcelmo, who knows the history of Markarth better than anyone. At the same time, she has a delivery she needs to make to him. Maybe you can do her a favor. You can find Calcelmo in Understone Keep. If it is your first time visiting him, he will initially be quite irritated, but will calm down quickly. Then you can tell him about the delivery from Kerah. He will understand why: "Oh, that's right. I keep forgetting to pick that up. Poor Kerah, such a patient woman." Then, he will reward you: "How about some gold? People seem to like that, I notice." After the quest, the ring will be available for purchase from Calcelmo's inventory. This issue has been addressed by version 1.3.3 of the Unofficial Skyrim Patch; Calcelmo will now equip the ring, which will prevent it. On the PC, it is possible to use the console to advance through the quest by entering setstage FreeformMarkarthD stage, where stage is the number of the stage you wish to complete. It is not possible to un-complete (i.e. go back) quest stages, but it is possible to clear all stages of the quest using resetquest FreeformMarkarthD. This page was last modified on 23 February 2019, at 01:57.